More than a 100 people - including civilians, police and Taliban militants have been killed in massive fighting in the past three days in southern Afghanistan, Afghan officials said Monday. Lt. Col. Maria Carl, a spokeswoman for NATO's International Security Assistance Force, said there is "definitely a large engagement that has been going on there," for the last three days. She could not confirm casualty figures. Because of the continued fighting in Uruzgan province, precise casualty numbers were hard to come by. Mullah Ahmidullah Khan, the head of Uruzgan's provincial council, said clashes in Chora district had killed 60 civilians, 70 suspected Taliban militants and 16 Afghan police. An official close to the Uruzgan governor, who asked not to be identified because he was talking about preliminary estimates, said 70 to 75 civilians had been killed or wounded, while more than 100 Taliban and more than 35 police had been killed. Earlier Monday, the coalition put out a statement saying seven children had been killed in a U.S.-led coalition air strike targeting suspected al Qaeda militants in eastern Afghanistan. That strike came hours after the deadliest insurgent attack since the Taliban fell in 2001. Police said Monday they had detained a suspect in connection with the deadly suicide bombing that destroyed a bus full of police instructors at Kabul's busiest transportation hub, killing 35 people and wounding 52. In an operation backed by Afghan troops, jets on Sunday targeted a compound that also contained a mosque and a madrassa, or Islamic school, in the Zarghun Shah district of Paktika province. Early reports indicated seven children at the madrassa and "several militants" were killed, and two militants detained, the statement said. Coalition troops had "surveillance on the compound all day and saw no indications there were children inside the building," said Maj. Chris Belcher, a coalition spokesman. He accused the militants of not letting the children leave the compound that was targeted. "If we knew that there were children inside the building, there was no way that that air strike would have occurred," said Sgt. 1st Class Dean Welch, another coalition spokesman. The U.N. Assistance Mission in Afghanistan said it has sent a team with the Afghan Independent Human Rights Commission to investigate the incident. Afghan officials have recently said that civilian deaths are the main concern of Afghans, and President Hamid Karzai has repeatedly called for foreign troops to do more to prevent civilian casualties. Meanwhile, police detained a suspect in the Kabul bus bombing after he was caught filming the aftermath of the deadly suicide blast, said Ali Shah Paktiawal, Kabul police director of criminal investigation. The suspect, whose name and nationality were not disclosed, had pictures of the slain Taliban leader Mullah Dadullah in his phone, as well as text messages from a foreign country, Paktiawal said. Sunday's enormous blast didn't leave much of the bus and it didn't leave much left of the notion that the renewed Taliban insurgency is being contained in Afghanistan, reports CBS News foreign correspondent Mark Phillips. The attack wasn't only deadly, it made several points: the Taliban attacks are becoming bolder, more frequent and are spreading across the country, adds Phillips. The bombing raised the specter of an increase in Iraq-style bombings with heavy casualties. 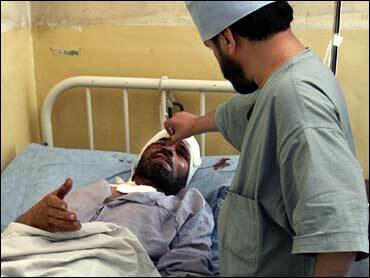 It was at least the fourth attack against a bus carrying Afghan police or army soldiers in Kabul in the last year. The bomb sheared off the bus' metal sidings and roof, leaving a charred frame. "Never in my life have I heard such a sound," said Ali Jawad, a 48-year-old who was selling phone cards nearby. "A big fireball followed. I saw blood and a decapitated man thrown out of the bus." The explosion was the fifth suicide attack in Afghanistan in three days, part of a sharp spike in violence around the country. Condemning the Kabul attack, Karzai said the "enemies of Afghanistan" were trying to stop the development of Afghan security forces, a key component in the U.S.-NATO strategy of handing over security responsibilities to the Afghan government one day, allowing Western forces to leave. A self-described Taliban spokesman, Qari Yousef Ahmadi, said a Taliban suicide bomber named Mullah Asim Abdul Rahman caused the blast. Ahmadi called an Associated Press reporter from an undisclosed location. His claim could not be verified. At least one person survived the morning bus blast. Nasir Ahmad, 22, (seen at left) a janitor at the police training academy, was sitting in the back of the bus when the bomb exploded. Speaking from a hospital bed where he was recovering from wounds to his face and hands, he said: "There were between 30 to 40 police instructors in the bus." It was the only full sentence he managed to utter before stopping from exhaustion. Interior Minister Zarar Ahmad Muqbal said initial indications were that a suicide bomber boarded the bus as it stopped to pick up police instructors at an open-air bus station in central Kabul. Such a suicide attack would represent a sizable jump in lethality compared to more typical Taliban suicide bombings, which often kill far fewer people. Maj. John Thomas, a spokesman for NATO's International Security Assistance Force, said it was too early to tell if the attack was a sign of more lethal bombings to come, or heavier involvement by al Qaeda. NATO commanders have long predicted a rise in suicide attacks this year. Afghan government officials, police and army soldiers are commonly targeted by insurgents trying to bring down Karzai's U.S.-backed government, and buses carrying Afghan police and army soldiers are common targets. In May, a remote-control bomb hit an Afghan army bus in Kabul, killing the driver and wounding 29 people. In October, a bomb on a bicycle exploded as a police bus went by in Kabul, wounding 11. Last July, a remote-controlled bomb blew up near an Afghan army bus in downtown Kabul, wounding 39 people on board. Insurgency-related violence has killed more than 2,400 people in Afghanistan this year, mostly insurgents, according to an AP count based on figures from U.S., NATO, U.N. and Afghan officials.